TeaVivre recently sent me a bunch of awesome tea to try, as well as some for a giveaway (More details on that in the near future)! I’ll be doing a video haul about all of it soon, and reviewing it in the near future, but today I’m just reviewing one. Two of the teas TeaVivre sent were blooming, and I was really excited because despite being a huge tea nerd, I’ve never had blooming tea. 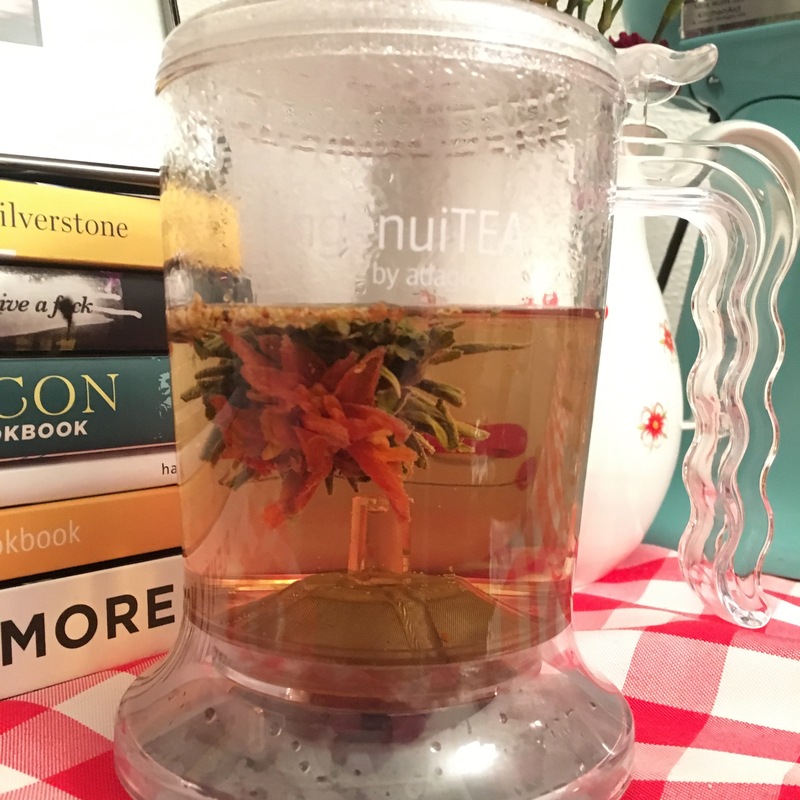 While visiting my friend and fellow tea lover Clare last weekend, we tried the Osmanthus Dancing green floral tea. 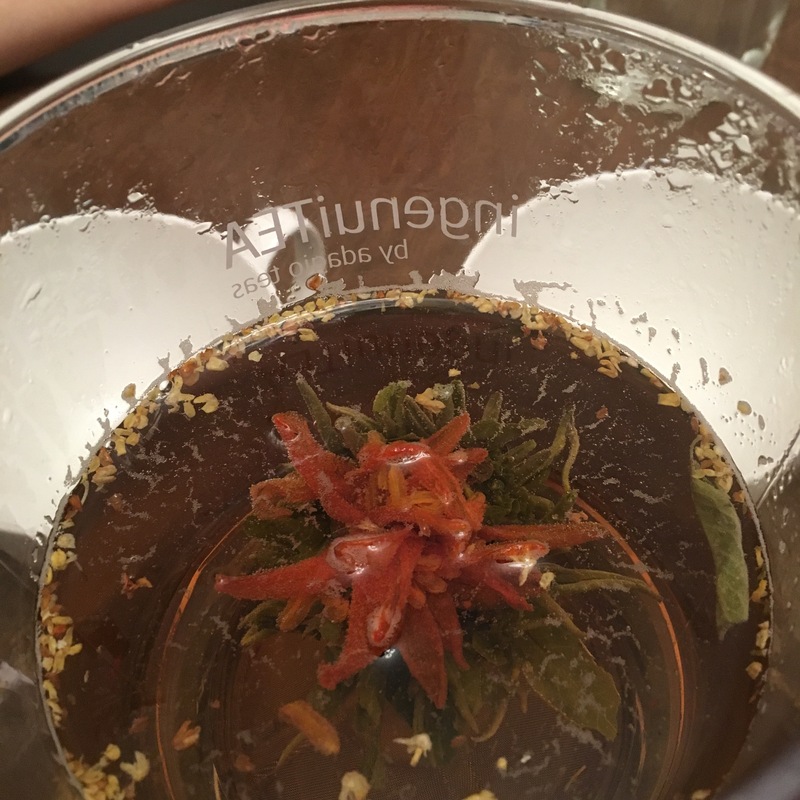 The experience of steeping it and watching it bloom was really fun and relaxing, and I also enjoyed the taste of the tea. This Chinese tea comes in a bundle. It has three simple ingredients: Mao Feng Green Tea, Lily and Osmanthus Flower, and is low in caffeine. You place it into boiling water for 5 to 6 minutes, and unrolls and it blossoms into a beautiful flower. We used her Adagio ingenuiTEA pot to steep this, which is nice because it sits on top of a teacup to pour it. As it steeped and “bloomed,” the tea flower opened and little flowers also started to flow out. The smaller flowers seen here are the “osmanthus.” This is where the dancing part comes in — they “dance” in the water and float out to the top as the tea brews. The larger pink hued flower is the lily, and green tea leaves are on the bottom. I’d never had tea with lily in it, but I really liked its aroma and taste. Aside from its beauty and entertainment value, this tea has wonderful flavor. It’s full but light, and kind of reminds me of a rose hip tea (one of my favorites) with its floral essence and smoothness. Since it’s a green tea, it’s a good choice to drink later in the day, because it leaves you feeling relaxed and soothed. If you like chamomile, jasmine and other floral blends, you’ll probably enjoy the Osmanthus Dancing Green floral tea. Let me know in the comments what your favorite blooming tea is! Thanks for sharing with me! This tea had such a wonderful, delicate flavor.